People it's becoming one big shooting gallery up there, first we have the near miss of Mars with asteroid 20007 WD5 today, then we have the close approach of asteroid 2007 TU24 yesterday, the above image, then we have the Spy Satellite free falling out of the sky. Okay, this intrigues me, being a Spy from way back when, I thought I better look into this one. To really understand what's going on here you have to think like a spy. We have stuff falling out of the sky regularly so why did we happen to hear about this one? Maybe the NSC wants the Russians and Chinese to know about this satellite so it would force their hand and use their antigravitational technologies, but the Russians and Chinese thinking like spys thinking that's what the Americans are trying to do and won't use their technology, but maybe the Americans don't really want the Russians and Chinese to get this satellite and think by saying how important it is, they think the Russians and Chinese will think they are just trying to force their hand and use the antigravitational technologies, and therefore they won't, so they win and the Russians and Chinese won't use their technologies to capture the satellite. I know what your thinking, Bob's lost his mind for sure, but maybe I'm crazy like a fox, after all I am a spy from way back when, I know how these people think, maybe I have been working for the NSA all along and have been passing code, eg. 20007 all along in my posts. Okay enough spy talk, I was washing dishes 6am Sunday morning when I was looking out my back window and thought wait a minute, it got bright all of a sudden, did the Moon sneak through the cloud cover I thought to myself, grabbed my camera which I always keep beside me now , ran out the back door and saw a cool Moon through what looked like a portal in space grabbed a couple of pics and got the shot. 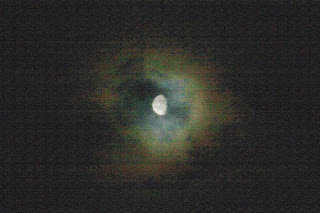 I'm gonna leave you now with a little video I took of the wolf Moon, notice the cool wispy clouds and the Moon's movement caused by the Earth's rotation, notice also the atmosphere turbulence causing it to look like it's going in and out of focus. There you go people, the largest title in blogging land, probably breaking some kind of writing rules with it, don't care, Bob breaking writing rules Johnson is what they call me. Early Morning Friday February 1st. 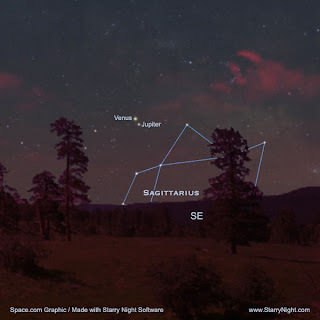 Venus and Jupiter get very close to each other, low in the SE sky. Then February 3rd. the Moon joins the grouping, should be a great photo op. I'll be out taking pics, weather permitting of course. I love these kind of events because everyone can enjoy them, don't need no scope or binocs, just yourself and the sky. One site I really recommend for events like these or any other celestial events is Sky View Cafe, in fact the only thing I recommend more is buying real estate. I use Sky View all the time, it lets me know exactly what is happening in my local sky, exactly where the planets, stars, deepsky objects are at any particular time, past , present or future, if you get anything from this site, that would be my greatest gift to you. I was honored this week with some awards. AngelBaby who has an interesting and cool blog about everything angels has awarded me with the Interesting Blog award, thanks AngelBaby!, I'd like to pass this award on to Anna who has very interesting photo blog which has helped me with some tech advice and settings on taking pics of the Moon and other night time objects. Swubird has a very interesting blog about science, technology and his life experiences in the military. Will has a very informative blog about healthy living for people and our planet Earth. And JD who has great site with awesome images and prose, very excellent blog. I will leave the other awards for future posts, don't want you to think it's all about me and how great I am, even though this blog is kinda all about me and my wacky cosmic adventures. Got another cool sunset the other day, never really saw the Sun because of the clouds, but the effect it had on lighting up the surrounding landscape with its changing colors was awesome. I took a bunch of images and stitched them all together, made a movie of it, you really notice the changing of lighting this way, hope you enjoy. In my quest to image all the Full Moons, I have now captured January's Full Wolf Moon, called the wolf Moon because in January the wolves are howling because they are hungry and cold like I was when I took this pic, man I felt like howling, at -27c I was a cold puppy. The next door neighbor's pugs were outside while I was taking this image, howling too because they were cold and wanted to be let back in their warm house. 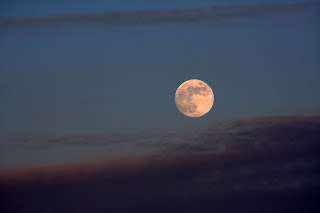 The January full Moon has been given a cooler name by the Omaha tribe,"Moon When Snow Drifts Into Tipis. 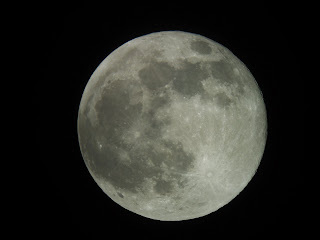 The next full Moon will be February's or "Moon When Geese Come Home" followed briefly by a Total Lunar Eclipse, February 20/21, if you miss it, the next one isn't till 2010. 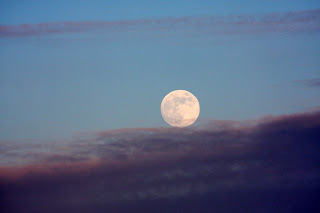 Why image all the full Moons, aren't they all the same? No, no they aren't, because the Moon doesn't have a perfectly circular orbit, it is out of sync with it's rotation, slips up and shows us a little of it's behind, this is called Libration. I took about 25 images with my Canon 40D and stitched them all together to make a movie. 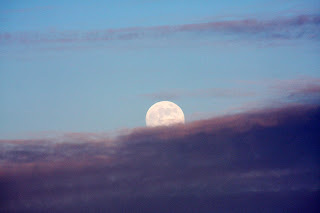 I took about 50 images of the Sunset and made a movie of it to post at a later date, hope you like the Moonrise. 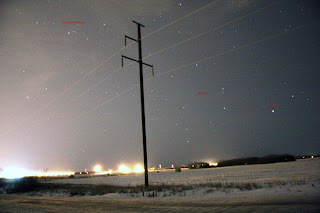 The University of Saskatchewan, Saskatoon campus caught an awesome fireball Saturday January 5th. 9:05 pm. My hats off to the staff and students for having a camera on top of the chemistry building to capture such events, too cool for school! A fireball is basically a large meteor, the fireball objects entering our atmosphere can range from a few inches to a few feet in size, entering our atmosphere at up to 70,000 mph they stop burning around 10-20 miles high and only 1-2% reach the ground to become a meteorite. Messenger had it's closest approach to Mercury Monday January 14th, another spacecraft had an important happening on that date as well. Ulysses spacecraft was at it's highest point over our Sun's north pole. 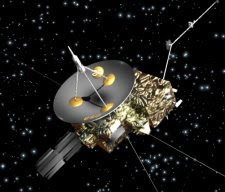 NASA and the ESA have joined together for the Ulysses mission, launched from the Discovery Shuttle October 1990 the Ulysses spacecraft used Jupiter for gravitational assist to orbit around the Sun's poles. Just as Earth's poles are crucial to studies of terrestrial climate change, the Sun's poles may be crucial to studies of the Solar cycle. The Sun goes through an eleven year cycle from minimum solar activity, things like Sunspots and flares to maximum activity. 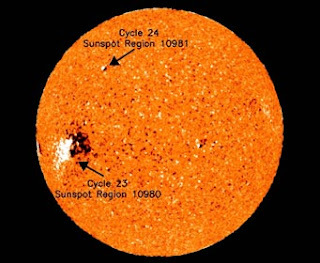 We are at Solar minimum and January 3rd was declared the start of a brand new cycle, cycle 24 has just started with the arrival of sunspot, active region 10981. Active region 10981 has an opposite magnetic polarity compared to active region 10980 and is at a high solar latitude, both indications a new cycle is upon us. What this means for me is more sunspots and flares to take pics of. Got my first picture of a Sunrise the other day and guess what, decided to make another animated gif, hope you like it. 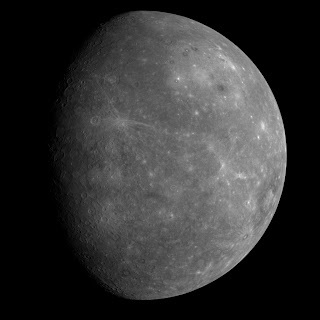 The above image of Mercury was taken about 17,000 miles out, 80 minutes after Messenger's closest approach of 126 miles. 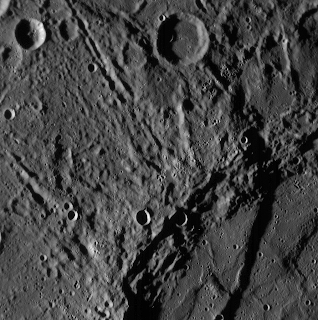 It is a view of Mercury never seen or imaged before. Messenger made it's closest approach to Mercury January 14th. on it's long 4.9 billion mile journey to it's final goal of orbiting the tiny planet. That's right 4.9 billion mile journey, I know what you're thinking, "Bob have you lost your mind? what's this billion stuff? it's only 60 million miles to Mercury!". Yes I have lost my mind but that's totally besides the point, apparently because of Mercury's fast orbit and it's close proximity to the Sun, Messenger has to do a lot of planet flybys to decrease it's speed enough to obtain orbital insertion. To date Messenger has flown by Earth once, Venus 2 times and has 2 more flybys of Mercury in October 2008 and September 2009 before it obtains orbit of Mercury March 2011. Will over at Healthy Living for People and Planet Earth brought up a good point in my comment section, Will asked why wouldn't the heat from the Sun burn up a man made probe to Mercury? Messenger has what they call a "sunshade" which amazingly enough protects the craft from the Sun and allows the electronics to operate at room temperature. We see what happens when the protective shielding doesn't deploy completely, like what happened with the first craft to visit Mercury Mariner 10. Part of it's protective covering didn't fully open after launch rendering some of it's electronics and experiments useless. 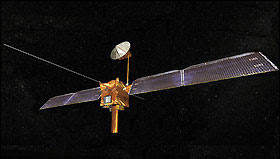 Mariner 10 made 3 passes of Mercury back in 1974/75, actually Mariner 10 was the first spacecraft to use the gravitational pull of a planet (Venus) to reach another(Mercury). Mariner 10 showed Mercury to be a cratered planet, it also showed Mercury to have a magnetic field, which is crazy talk, magnetic fields are usually associated with larger planets that spin rapidly, Mercury takes 59 days to rotate and it's molten core should have cooled off long ago. Messenger hopes to answer a lot of Mercury's unanswered questions, where does it's atmosphere come from, is it shrinking and why it is so dense with metals. I have another One of my animated gifs for your viewing pleasure, a picture I took of the Andromeda Galaxy core back in the summer of 2007. Hey I have approximately lots more images to keep em coming till Messenger Orbital Insertion 2011. It's been pretty cloudy and miserable around here for the past week, since I got the new camera not much time to use it, feel like I'm all dressed up and no where to go. The last time I was able to get out and use it was over a week ago during the Quadrantids meteor shower, so when we got a break in the clouds, got the chance to get out and get me another sunset. There was some kind of what smelt like burning forest fire smoke in the atmosphere, gave the Sun a real cool look, awesome colors. Shuttle Atlantis (STS 122) has a new target launch date, February 7th., this should give NASA plenty of time to install and test the new connection which replaces the faulty one that caused false readings in the engine cutoff system. 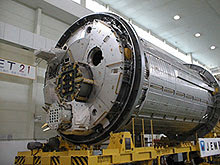 Atlantis's main mission is to install and activate the European Space Agencies Columbus Laboratory. 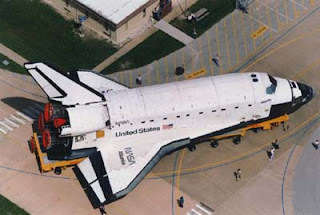 Shuttle Endeavour (STS 123) scheduled to launch on February 14th. will be pushed back to the middle of March. One of Endeavour's main missions is to deliver and install Dextre a robotic arm addition. 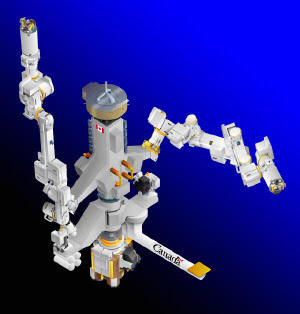 Dextre is a sophisticated dual arm robot for very precise work. Endeavour will also be delivering the first part of the Japan Aerospace Exploration Agency's Kibo, an experimental module/laboratory focusing on space medicine and biotechnology. I'll leave you now with an animated GIF of my latest sunset. UPDATE: The chances of asteroid 2007 WD 5 hitting Mars are now 1 in 10,000. Observations from 4 different observatories have indicated the asteroid will come no closer then 4,000 kms. to Mars. The above image is the location of my acreage on the Moon, I mentioned the purchase here and there was a review of it here and I thought I would talk further of it here. I am the proud owner of an acre of land in the Campanus Crater, named after Johannes Campanus an Italian mathematician, 1220-1296. 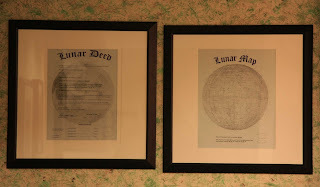 The exact location is, Lot #15/1247 26-30 degrees S.; 30-26 degrees W.
Just to prove I'm not crazy, or crazy depending on how you look at things, I took a pic of my Lunar deed, all legal and such. Just think of the conversation possibilities at all the dinner parties I frequent, "So Bob", "Yes Jim" "Do you happen to own any real estate?"" Why yes Jim, I do, I have a house in South Saskatoon, Wildwood, and an acreage in Campanus Crater" "Campanus crater, is that in the south part of town as well?" "Well no Jim, it is in the south part of the Moon." 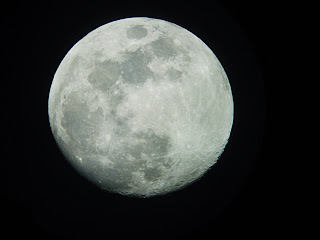 See, you'll be the talk of the town, when ever people look at the Moon they'll be thinking of you, get your Lunar Property today, maybe we can be neighbours. Now that the Quadrantids meteor shower is over it's time to look forward to the next one, which isn't till April 22nd, the Lyrids. I'll keep you up to date on the wheres and whens on all upcoming showers throughout 2008. The next big event is the total Lunar Eclipse for most of the Western Hemisphere on February 20/21. 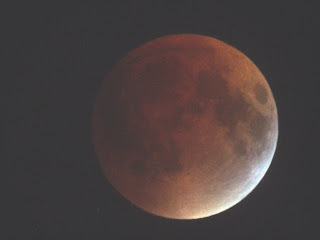 The above pic is an image I took of our last Total Lunar Eclipse August 28, 2007. If you miss it you'll have to wait till 2010 for the next one, that's a long way away, here's hoping the weather works for you. The chances of asteroid 2007 WD5 impacting Mars have been lowered to 1 in 40 from 1 in 28. Observations made at the Calar Alto Observatory have scientists predicting the asteroid missing Mars by 18,641 miles. 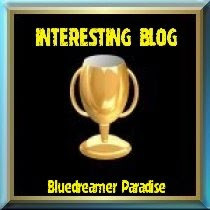 AngelBaby who has a super blog about angels and such has awarded me with a great blog award, I am honoured to be a recipient of this award and would like to pass it on to a some of my fav blogs that I read. 1: swubird, a cool blog about science, WMD's, social issues and basically all kinds of cool stuff. 2: The Uneasy Supplicant, awesome prose and images. 3: Will, great blog about healthy living for people and planet Earth. 4: Hope Radio, inspirational site for the support of the military who fight for our freedom. 5: Peripheral Vision, a great site for photography and abstract paintings. 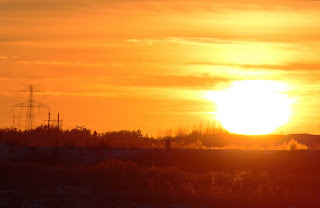 6: Sue's Daily Photography, just awesome images of my fav sunsets and palm trees. 7: Mr. Grudge, a place to go talk about writing and has very cool stories. 8: Life On The Blade, an all around inspirational blog. I want to leave you now with , that's right another GIF animation, thinking of renaming my blog, Blackholes and Astrogifs. UPDATE: Scientists have revised their probability of asteroid 2007 WD5 hitting Mars to a 1 in 40 chance down from a 1 in 28 chance estimated January 2nd. Asteroid 2007 WD5 is expected to miss Mars by 18,641 miles. People I'm soo happy! Got my first image of a Meteor, a Quadrantids meteor no less. Left my house at 12:30 am Friday morning and headed out to a predetermined spot I had scoped out earlier, just on the outskirts of town. Had done my homework, read the instruction manual on the camera, had an escape plan in case a mugger saw me on the side of the road at 1 in the morning and decided to make me their next victim and I had me some star charts and a drink, don't want to get dehydrated. So I get to my site, get out of the car and as I unfold the tripod one of the legs falls completely out, I'm looking at it on the ground in disbelieve, this can't be good I'm thinking, so trying to make it all better I stick it back in and for the rest of the night I forget its not permanently attached and every time I lift the tripod to move it, the leg falls out again and again.... and again. At least the weather co-operated, only about -12c. Had the camera pointed at the radiant, but the two hours I was there only saw about 5 meteors, all short, by the time the radiant had risen above the horizon the peak was over. 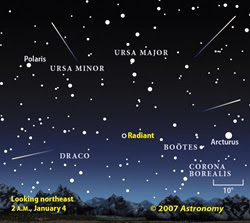 The Quadrantid link above has some cool facts about meteor showers, for instance did you know that the average meteor is the size of a pea and weighs less then 1 gram? Or did you know that meteors become visible at an average height of 55 miles, and nearly all burn up before 50 miles altitude?, probably cause they're travelling between 50,000 and 165,000 mph. 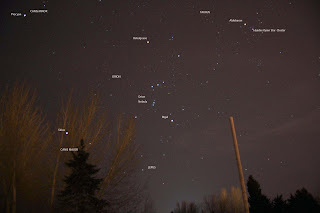 After I had set up the camera and the broke tripod, I decided to look around at the magnificent sky, right behind me Orion the mighty hunter was stunning, It was awesome, one of the reasons I got into astronomy in the first place, looks so beautiful at a dark site, his faithful hunting dogs Canis Major and Canis Minor helping Orion fight Taurus the bull and chasing Lepus the hare. There is no way I can put into words the feelings I had that morning, the beauty of the early morning sky, the quite, it's moments like these I thank God for putting everything in just the right place. I'm going to leave you with.... that's right another GIF, this one I spent a lot of time taking and setting up, got one light just right so it looks like the Sun is rising off in the corner, looks surrealistic, hope you like! UPDATE: Due to new observations made of asteroid 2007 WD5, December 29, 31 and January 2, the chances of the asteroid impacting Mars are now 1 in 28, down from 1 in 25. Stay tuned for further developments. Got a break in the clouds last night and was able to get my first sunset of 2008, I love sunsets sooo much, I even love animated GIF sunsets even more, that's right another animated GIF, consider it my GIF to you, get it , GIF, gift, hey how bout this one, my favorite saying from one of my favorite movies Galaxy Quest "Never GIF up never surrender! ", people I've got a million of them, that's the problem got too much time on my hands for word play, should be out doing science with my scopes but too many clouds, right now there is a sunspot happening on the surface of the sun. Active region 0980 , supposed to be the remains of the last active region I missed 0978, as I was doing this post there was an update, we like updates, active region 0980 at 0958 UCT produced a class C1 flare ( small, no problems to Earthlings) and a Coronal Mass Ejection to boot. Just a reminder about the Quadrantid Meteor Shower. The show starts this Friday 1am EST. low in the N.E. to start, travelling directly overhead by sunrise. Expect 1-2 meteors a minute, as long as there are no clouds I'll be up and out cold and all, I really really want to get a pic of one of its meteors. No more updates since Friday December 28th. concerning the maybe Mars attack asteroid, if I hear anything I'll do an update, look for the red UPDATE at the beginning of this post, right now there is a 1 in 25 chance of the asteroid actually hitting Mars. 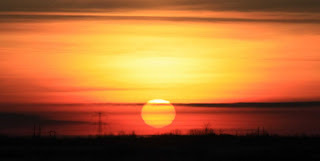 I'll leave you now with another image I took of the very first Saskatchewan sunset of 2008.